This bizarre dream happened last Thursday. It seemed to be directed more at my husband – so I gave him a head’s up – as it pertains to his work. We were lying in bed and I noticed bright lights outside. Then it seemed like our roof disappeared – or became transparent – as we looked up and saw clouds moving fast – with what looked like giant wheels coming down. 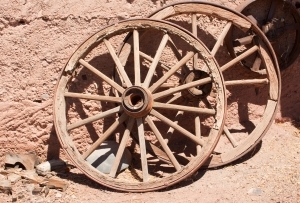 The wheels were like old fashioned wheels with spokes. We were told telepathically that someone higher up would be mad about an issue at his work – but that he would resolve it and they would eventually apologize for blaming him. THEMES: Message from the higher self, reassurance, panic, worry. SYMBOLS: UFO, bright lights, wheels, probe, message. INTERPRETATION: I feel that this is a prophetic dream (we’ll see!) – even though my husband is always having to solve other people’s problems. He has been annoyed and worried of late, that his superiors don’t value him and continue to heap work onto him – even though he always does his work in a timely and professional manner. UFO’s and aliens represent the higher self or spiritual assistance. Some say that UFO’s etc have replaced religion and that they are also symbols of higher powers. In this case – I feel that it could have been a message from ‘beyond’ – or even just our own psyche’s issuing a warning. Bright lights symbolize illumination – alerting us to the fact that all will be revealed. Wheels turning in the sky – indicates a pun (wheels of the mind turning, the squeaky wheel gets the grease, momentum, things happening). Also – machinations of the powers that be. 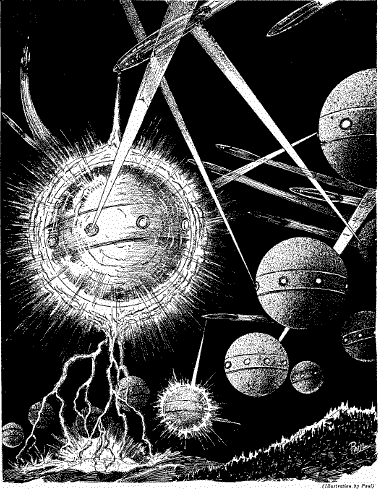 The probes and orbs trying to pierce our eyes simply indicate a message trying to penetrate our field of vision. The message showed that there would be something to deal with – but that all will turn out fine – in the end. SUMMARY: This is an ongoing issue for my husband – so it would be nice to see that people finally start recognizing his worth and abilities. This entry was posted on May 2, 2015 by lilithu. It was filed under dream interpretation, Writing and was tagged with analysis, dreams, psychology, ufo, visions, workplace.